A panel appointed by the Union Ministry of Environment and Forests (MoEF) to recommend measures to protect the Western Ghats has objected to proposed power projects in the region. The Western Ghats Ecology Expert Panel (WGEEP), in its report, has asked the ministry not to give environmental clearance to two specific projects—Gundia hydroelectric power project in Karnataka and Athirappilly dam on the Chalakudy river in Trichur district of Kerala. If these projects come through, they will lead to the massive loss of biodiversity and change in the basin's hydrological regime and make many of the perennial streams seasonal, the panel has said. The land rights of the forest dwellers under Forest Rights Act have also not been settled at either of these project sites, says the report. 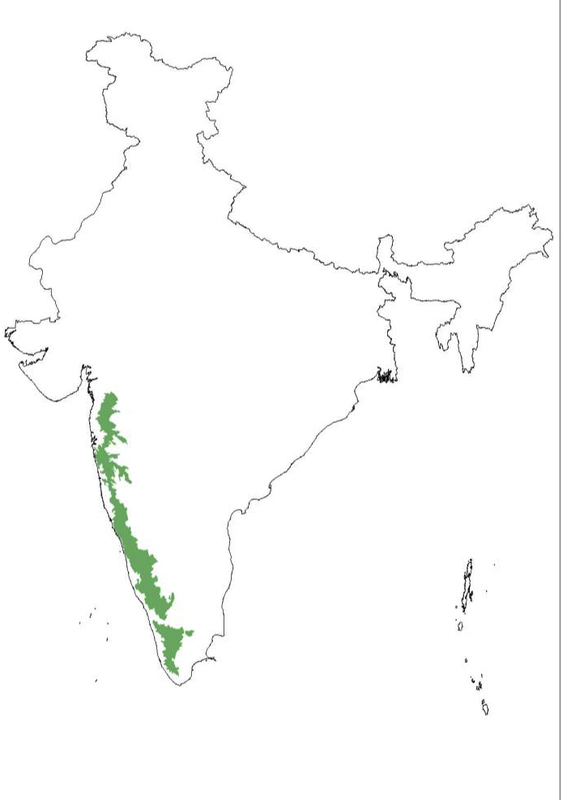 The expert panel, headed by environmentalist Madhav Gadgil, was constituted with the specific madate to make recommendations for the conservation, protection and rejuvenation of the Western Ghats region by following a comprehensive consultation process involving people and governments of all the states concerned. The panel submitted its report to the ministry in August last year. Down To Earth has a copy of the report which has not been made public by MoEF yet. The panel is also very critical of the 113 MW wind power project being developed near the Bhimashankar Wildlife Sanctuary in Maharashtra. The Rs 772-crore project, spread over 14 villages and 194.66 hectares of reserve forestland, is promoted by Enercon (India) Limited. The report says that the project has caused substantial forest destruction and triggered large-scale soil erosion and landslides because of poor construction of roads on steep gradients. The construction rubble ends up on fertile farmland and in reservoirs of tributaries of the Krishna river. 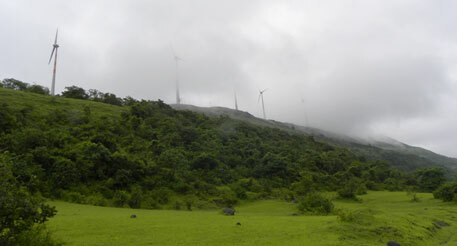 It says that the hills where wind mills have been installed receive high rainfall and are biodiversity-rich. 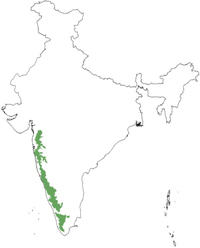 The evergreen forest is contiguous with the Bhimashankar Wildlife Sanctuary, which is home to Maharashtra’s state animal, the Malabar Giant Squirrel or Ratufa indica. Reportedly, land rights of forest dwellers of the area have also not been settled. They are even being denied free movement in the area. 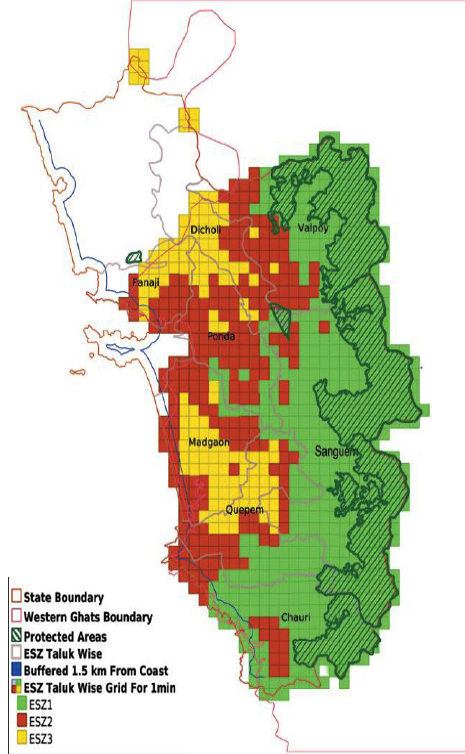 The panel has divided the Western Ghats into three categories—Ecologically Sensitive Zones (ESZ) I, II and III, depending upon the eco-sensitivity of the area. It proposes that environmental clearance should not be given to any large-scale storage dam in ESZ I and II. It has made recommendations on phasing out and regulating activities in accordance with the zoning. environmental issues on the model used for the Mahatma Gandhi National Rural Employment Guarantee Act in Andhra Pradesh. For the state of Goa, the panel recommends an indefinite moratorium on new environmental clearances for mining in ESZ I and II, and phasing out of mining in ESZ I by 2016. ESZ I areas include national parks and wildlife sanctuaries. But the panel allows continuation of existing mining in ESZ II under strict regulation with an effective system of social audit. The WGEEP report has also dwelt on illegal mining in Goa. It notes that iron ore excavation, which is the main focus of mining industry in Goa, has increased from 12.1 million tonnes in 1992 to 41.1 million tonnes in 2009, with a 20 million tonnes increase in the past five years alone. Most of the mining in Goa is in the Western Ghats in and around national parks and wildlife sanctuaries. The mining belt extends 65 km from southeast to northwest, spanning some 700 sq km. “Around 2,500 ha of forest area has been lost to mining in the period between 1988–1997,” the report says, quoting TERI, a policy research organisation. No studies to assess the loss in forest area in the Western Ghats have been done since then. Forests are practically non-existent in some parts of the Bicholim taluka where mining has been on since the late 1940s. In parts of Sattari and Sanguem talukas, forests are affected because of mining overtaking villages. Biodiversity loss resulting from mining operation in the region is very serious, the report says. The WGEEP report has observed a number of environmental impacts of mining in Goa. 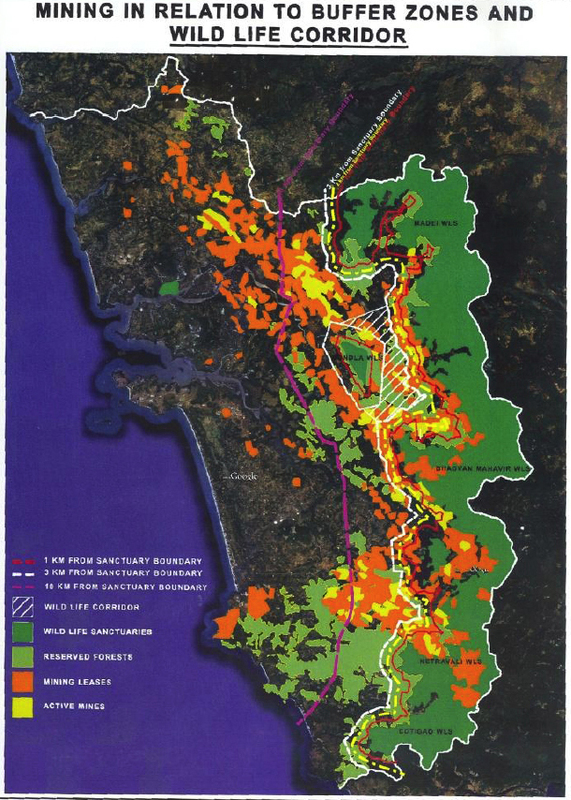 “Sedimentation of river beds and estuaries, particularly the Mandovi-Zuari estuarine complex, and the resultant flooding of the rivers like Bicholim and Sanquelim have been attributed to this activity. Dumps are located close to water bodies, which contributes to the silt runoff into the water especially during Goa’s heavy monsoons,” the report says. According to the panel, waste water discharge from mining is a major threat to soil fertility and agriculture in the region. Pumping out of ground water for mining activities has affected the hydrology of the region. “Water shortages as a result of mining activities have been well documented by TERI in 1997 and 2002. Evidence from TERI studies in 2006 also reveals that the impact of changes in groundwater is disproportionately borne b y women who are more vulnerable to insecurity, poverty, and ill health,” the report says. The panel experts during their visit to various mining sites noticed enormous amounts of mining waste piled high. Some of this overburden waste is being mined currently as it contains material of an iron content that has a market in China. “Another important concern is how the mines will be filled once the ore is exhausted, if we export most of this excavated material out of the country,” the report says. The movement of minerals by road as well as rail from Karnataka to Goa for blending with local ore for its upgradation as well as export by mine owners through Mormugao Port Trust and for five sponge iron plants located in Goa is the main cause of air pollution in the region, says the report. “An ongoing TERI study estimates that 39 per cent of emission loads of PM10 (particulate matter) in Goa are from the mining region and 25 per cent from industry. Studies say that exposure to air pollution, especially respirable suspended particulate matter, is high in the mining clusters and transport corridors in Goa, affecting the health of local communities, the panel has reported. Mining leases in the catchment area of dams used for drinking water to be terminated. The panel has pointed out that many of these environmental and social impacts do not get reflected when one hears of the value that mining contributes to the gross state domestic product (GSDP). 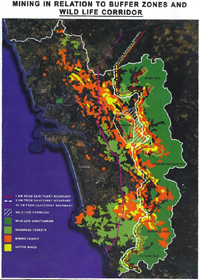 “An exploratory study to value some of the impacts of mining in Goa using 1996/97 data, for example, suggested that even if this partial accounting of the environmental and social impacts is netted out of the value created by mining activity in terms of value added to GSDP, the true income would be only 15 per cent of the reported income,” the report says. More recent papers suggest that the benefit-cost ratios no longer favour mining in Goa, the panel says. Pointing out governance failures, the panel says, “the total failure to implement the community forest resources provisions of FRA in Goa has absolutely no justification. To take a specific case, the Devapon Dongar mine of Caurem village in Quepem taluka of Goa is located on a hill sacred to the Velips, a Scheduled Tribe group, and to sanction a mine on this hill against stiff local opposition, and without completing the implementation of FRA is thoroughly inexcusable.” Illegal mining is observed in Goa, both in terms of no clearances obtained, fraudulent EIAs and/or flouting of conditions of environmental clearances. “The Panel has obtained a list of mines that are flouting environmental conditionalities in terms of extracting ore beyond output limits,” the report says. The environment impact assessment (EIA) process, which is central to protect the ecosystems in the Western Ghats was found to be defective on several counts, such as poor quality of EIA reports. Not only were EIAs found to be fraudulent at times, but many a time the minutes of public hearings were also manipulated. For example, the EIA report for Devapon Dongar mine of Caurem states that there are no water courses in the mine lease area. Field inspection by WGEEP revealed the presence of two perennial springs. The panel says that environmental clearances are given to individual projects so the cumulative impacts of projects are ignored. “It seems to us that mining in has crossed the social and environmental carrying capacity of Goa,” the report asserts. Gaurav Shirodkar of advocacy group EIA Resource and Response Centre (Western Ghats Cell), says it has become evident in the past few years that EIA reports have been fabricated to suit project proponents. There have been umpteen instances of false EIA reports and many of them even proved in the court of law. “There is a call to stop all illegal mines immediately, now the question is how to identify illegal mines,” he says. Almost all the mines are violating the specific conditions of environment clearances, there is no compliance with any environment management plan, thus technically all mines are illegal, says Shirodkar. He adds there are instances where public hearing of multiple mines in south Goa have taken place together and at a place about 20 km from the site and homes of affected communities. There are no detailed hydro-geological studies done, mandatory identification of forest is incomplete, FRA is not implemented and carrying capacity study and cumulative impact assessments are not done, he says. “Considering the size of the state and its eco-sensitive nature, the recommendations (see box) should be implemented first and then the government should decide on continuation of the mines,” says Shirodkar.